PROFILE: Will Passenger “Go” On To The U.S.? Driving his way around the world. Seems like for at least the past few years, we’ve always had an international solo act that writes and sings their own material and dominates the charts with a breakup anthem that you just can’t escape. In 2011, it was Adele‘s “Rolling In The Deep”. In 2012, it was Gotye‘s duet with Kimbra, “Somebody That I Used To Know”. Both sold bucket loads and won awards for their compositions, even if each act didn’t have the same level of success after their signature songs. While we have acts like Ed Sheeran and Emeli Sandé climbing the national surveys today, I’m inclined to think that there may be another act in the wings waiting to breakout and attain that same level of success. With that, let me introduce you to the singer and song that may do it: Passenger and his international hit, “Let Her Go”. 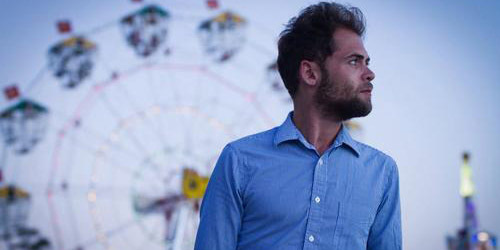 Passenger is a one-man band, 28-year-old British singer-songwriter Mike Rosenberg. He started performing at age 16. Rosenberg previously fronted a band baring the same name that broke up in 2009, and he decided to carry the name with him as he began his solo career that same year. His first albums came and went with little notice, but it’s his third album, All The Little Lights, that seems to have everyone interested him. (It’s been out in the U.S. since late August of last year via Nettwerk Records.) A first single, “The Wrong Direction”, didn’t chart in any territory, but his second release, the aforementioned “Go”, became a major hit in Europe beginning in the summer of 2012. It’s already gone to #1 in Austria, Sweden and The Netherlands and now it’s securely at #1 on iTunes in Australia, which will likely take it to the top of the ARIA Singles Chart there. (UPDATE: It rose 23-2 in its second week on the chart, but is still #1 on iTunes.) In total, it’s charted in over a dozen countries so far, most within the top ten. His album has also been a top ten seller in countries like Germany and Ireland. He recently toured in Australia and New Zealand as the opening act for Ed Sheeran and is now on his own headlining tour in the same region. How fast those things seem to grow. As for the song itself, it’s a really pretty one. It has a minimal arrangement, at times entirely a capella, but is still commercial sounding in its own way. What really drives the song is that Rosenberg has a really distinctive voice, one that would especially stand out here, but in a good sense. It sort of reminds me of a mix of Ben Howard and Paolo Nutini, both of whom have had some degree of success here. It’s one of those songs you just want to listen to if you’re feeling down and can’t shake the memories of an old flame. In fact, that’s reflected in the lyrics pretty elegantly: “You see her when you fall asleep/But never to touch and never to keep.” As the expression goes, you don’t know what you’ve got until it’s gone. You realize that you need some essential quality, but it doesn’t happen until after it’s gone. He can put it better than I can: “You only need the light when it’s burning low/Only miss the sun when it starts to snow/Only know you love her when you let her go.” It’s a song that can touch a lot of people, like “Rolling” and “Somebody” did during their respective years in the spotlights. Watch out for Passenger to fill that void at some point. So, what happens from here? It may be that the sudden sales in Australia translates into Nettwerk promoting “Go” to both Canada and the United States later this spring. It could be longer. It’s currently being considered for only Triple A radio here, but that could easily be expanded. Regardless of what it happens, it will happen, and then maybe you’ll be tired of it by the 200th time you hear it on the radio. For now, it’s a fresh sound that may be the next to pop on the mainstream circuit. You may “let her go”, but don’t let this one do the same. Download “Let Her Go” on iTunes. / Download All The Little Lights on iTunes. Are you already enjoying Passenger’s music? Think he can break the U.S. market successfully? Let me know in the comments or on Twitter: @AdamFSoybel. UPDATE: “Let Her Go” goes for adds at hot adult contemporary radio on April 29! Here’s to a great U.S. run for it. She’s got a ticket to Ryde. 30-year-old Ryder hails from Toronto and has been recording for over a decade, but it’s been just within the past few years that she’s been putting out material to a larger audience thanks to her record deal with EMI’s Canada division. She first made Canada’s Singles Chart in 2007 with “Weak In The Knees”, the first release from If Your Memory Serves You Well, which was introduced to me by my friend Mike from The Max Online. It was more of a folk-driven song, but I liked it for a while, and it ended up peaking at #49 in her native country and went Gold, as did the album. (It never ended up making my personal chart.) Followup single “Calling To Say” did better, edging up to #40. 2008 brought her next album, Is It O.K., which also went Gold but didn’t place any singles really highly. I remember listening to “Little Bit Of Red”, the first single, for a few weeks before eventually tiring of it, and it peaked at a disappointing #82. I’m guessing that people thought that was it for her given her diminishing peaks, but she came roaring back in 2012 with a major hit in “Stompa”, which marked a significant change in style for the singer into a more rock-influenced sound. It worked; the song’s gone top ten in Canada and garnered her another Gold certification for both the song and parent album Harmony. With that success behind her, her U.S. label, Capitol Records, is ready to bring her into the United States and onto adult album alternative radio, where the song will be a perfect fit. It meets nicely in the middle between a Joan Jett & The Blackhearts record from the mid-80’s and Adele‘s soulful yet biting song that is 2011’s “Rumour Has It”. With lyrics about putting away your troubles and getting lost in the sound of the music, everyone should be able to like it. Look for the song to have quick ride (or ryde if we’re still going for puns) up the charts. I’m certainly rooting for it. Remember when Gotye and Kimbra‘s “Somebody That I Used To Know” blew up and a video went viral of a quintet singing along to the song while all of them played the guitar at the same time? Look no further than this group out of Burlington, who first got together in 2006 and recorded two independent albums together. When their cover video made them an internet sensation, they landed a spot on The Ellen DeGeneres Show and got signed to Columbia Records, who picked up the song and distributed it digitally. It became a top-20 hit in Canada and went Platinum, though it didn’t out peak the original composition, of course. In terms of bigger projects, the label has thus far released a four song EP by the band called R.E.V.O. in October. A full-length album, also bearing the same name, will be out on March 19. At same time, the band has been continually putting up new videos of both original songs and cover versions of popular songs, like Taylor Swift‘s “I Knew You Were Trouble”, which was recognized by the artist last month. Their first song to be issued to radio here in the States is “Hands”, which has already been a minor entry in their native country. While not an acoustic track like most of the material they seem to be synonymous with, it should be a hit with those listeners who like fun., Jason Mraz and Michael Franti & Spearhead. It has the same sort of organic but full studio sound that those acts do well, with a heavy drum beat and sing along chorus. Although, given our sensitivity to gun control and shootings in the news lately, a line like “that gun is loaded/but it’s not in my hand” may be a little much for some people at radio at the current time. Otherwise, it’s a fun and playful tune that will get you clapping along this summer. What do you think of these two songs? Are they hits in the making or will they not make the rankings? Let me know in the comments or on Twitter: @AdamFSoybel.